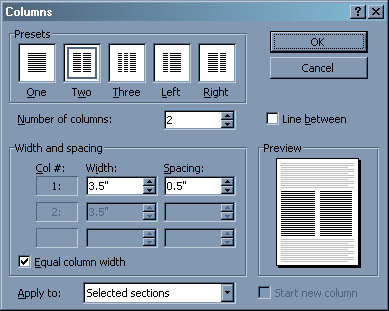 I configure Microsoft Word to format text I selected as two evenly distributed columns. After making my selections, I click the OK button in the Columns configuration window. What number must be between 1 and 45? 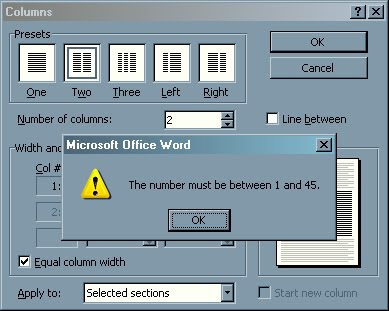 What number on this form is not between 1 and 45? The number of columns. Clearly a bug of some sort. But I haven't figured out how to fix the error to get the column format the way I want. I have the exact same problem. I am running WinXP SP2 and Word 2003 SP3. This is VERY annoying!!! If you copied information from the Internet, you may have weird hidden line breaks with some of your text that cause this annoying message. Select all of your text, copy it into a text document without any formatting (e.g. Notepad), copy this unformatted text and re-paste it into Word. The column error message should be gone and you should get your columns. It's even easier, but I needed your tip. I copied the info and did a 'Paste Special', then selected 'Unformatted" text. Worked like a charm. Thanks.